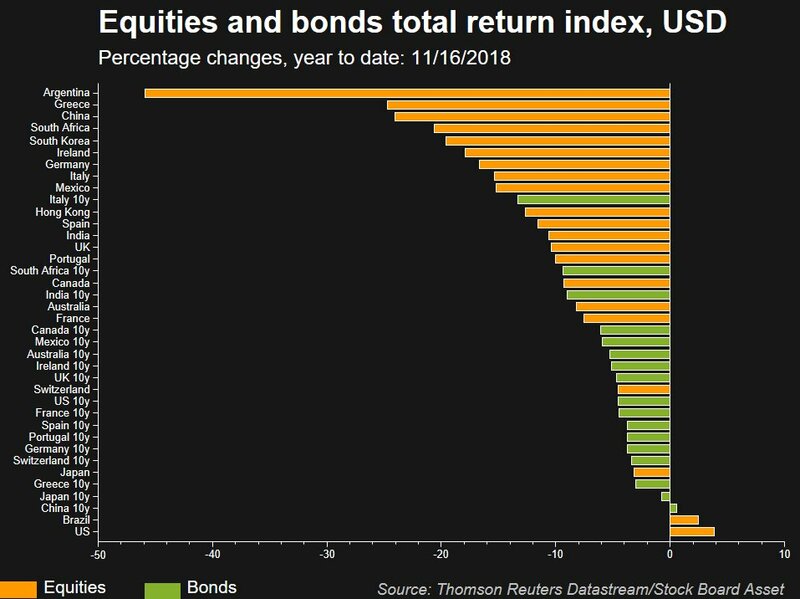 It’s a great table for it shows that both bonds and stocks around the world have suffered this year with almost no financial asset class posting positive returns. Brazilian and American stocks, along with Chinese 10-year bonds, were the only ones that could muster a return with a plus at the front. And even those returns were anemic. So what gives? Why the terrible year for financial markets? It’s easy – the Fed. The Federal Reserve is the global central banker to the world. They might not like it. They might wish it different, but it is what it is. For the past three years the Federal Reserve has been slowly tightening monetary policy through two methods – a methodical steady raising of the Fed Funds rate along with a systematic winding down of their balance sheet. It was like a game of musical chairs with the Federal Reserve taking away a chair at every other meeting. Many market commentators mistakenly believed the U.S. economy impervious to this monetary tightening. Some others argued the higher real rates attracted capital and caused a counter intuitive pro-economic response. Well, I don’t buy any of that for one second. The reality is that the world (including the U.S.) has never been so indebted. Reducing liquidity through tighter monetary policy of the global reserve currency will have an outsized economic and market reaction due to this large amount of debt. So when I look at Alastair’s table, I think it is easy to explain. The Federal Reserve has caused both a global economic slowdown along with a bear market in most financial assets. Although many argue the Federal Reserve’s rate tightening campaign has so far been shallow and in the early innings, they are missing that when the Fed approached the zero bound, instead of sending rates to negative levels, they engaged in massive quantitative easing. This was monetary accommodation and although it didn’t send rates below zero, academics have created a method of measuring the “equivalent” rate. This is known as the Wu-Xia Shadow Rate. I have long argued that although the first rate hike was in late 2015, monetary policy had been tightening since the Federal Reserve started tapering their quantitative easing. 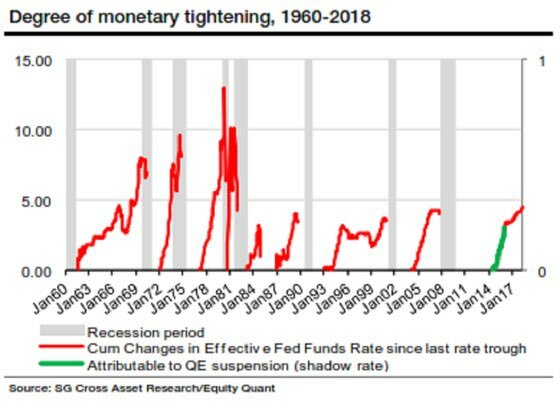 One of my favourite pundits, The Long View @ HayekAndKeynes recently reminded market participants that when you incorporate the quantitative easing suspension, this tightening cycle is much longer in the tooth. This campaign is now approaching a level of monetary tightening where the Federal Reserve has paused in the past. Now don’t send me a note railing against cheap monetary policy or how the Fed needs to raise rates to normalize the previous madness. I am not interested in debating what should be done but rather what on what will be done. 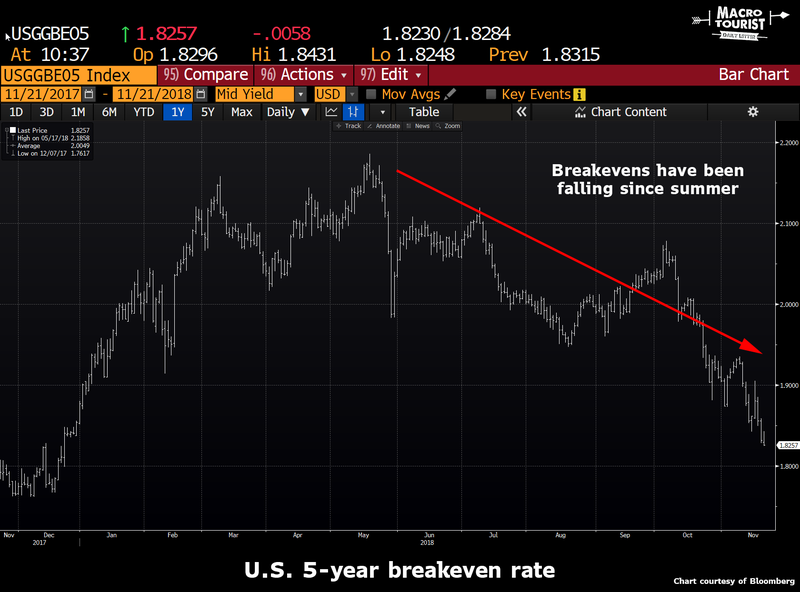 It is clear to me the Federal Reserve was intent on raising rates until something broke, and that last week enough things “broke” that they finally blinked. Or maybe, even though they are loathe to admit it, President Trump’s haranguing finally kicked in? I can already hear the push-back to my argument that the Fed blinked. Won’t deny that for one second. I definitely believe absent some catastrophic development, the Federal Reserve will raise rates next month. But what’s changed is that previously Powell had convinced the market (or at least he mouthed the words) that the Fed was on track to raise rates at every other meeting, and that little would bump him off that course. I know it seems like a subtle distinction, but the market has interpreted this as the Fed blinking. 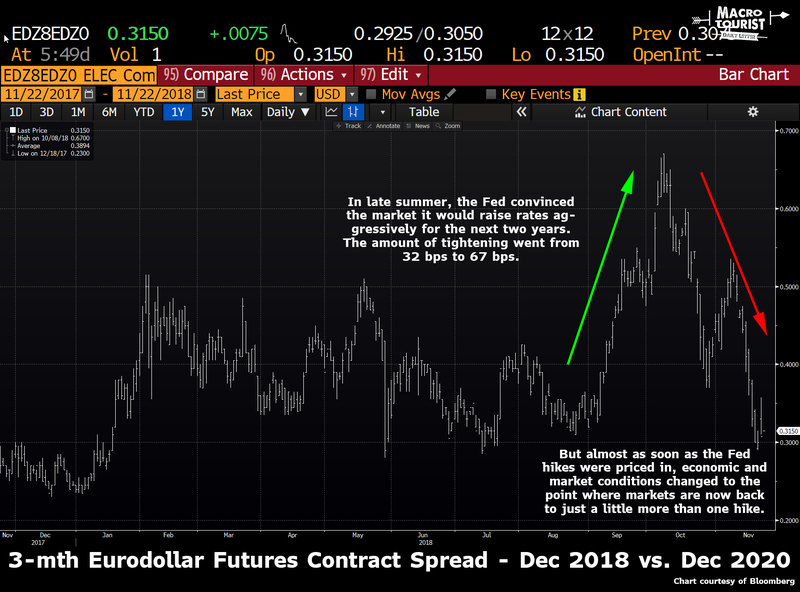 Let’s look at the 3-month Eurodollar futures contract spread between December 2018 and December 2020. Although Eurodollar interest rate futures do not track fed funds perfectly, they are close enough for our purpose. This spread represents the total amount of rate rises between December 2018 and two years later. Earlier in the year, the Federal Reserve had been frustrated that no one believed their Dot Plots with their forecasted rate hikes. Yet in a supreme piece of irony that only Alanis Morrisette would appreciate, when the market finally accepted their hawkish rhetoric, it caused the economic and market slowdown the Federal Reserve had been trying to engineer. So let’s recap. 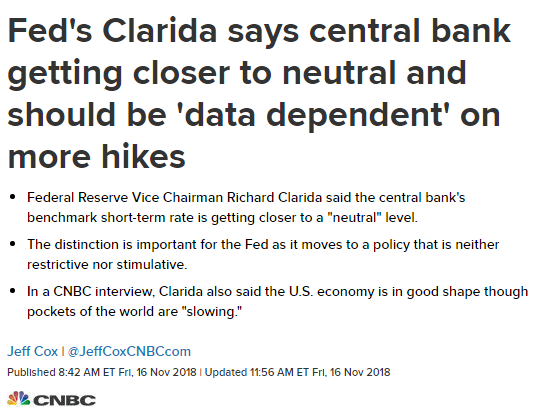 The Federal Reserve had previously been plugging their ears and telling the global financial community nah-nah-nah-we-can’t-hear-you-we’re-going-to-keep-raising-come-hell-or-high-water, but the economic and financial market weakness that was previously confined to the rest of the world, has finally come to America. The Federal Reserve is now very close to being on hold for the indefinite future. Sure, they will probably raise once more this December, but it’s most likely a one-and-done. Or at very least, much more a one-and-we-will-see. What does this mean for the market? Tons. Whereas before investors were hiding in American stocks and shooting every other asset class, it’s probably time to do the opposite. Buy emerging markets. Sell U.S. dollars. Play for a steepener in the American yield curve. Buy commodities. Now maybe it’s too early. 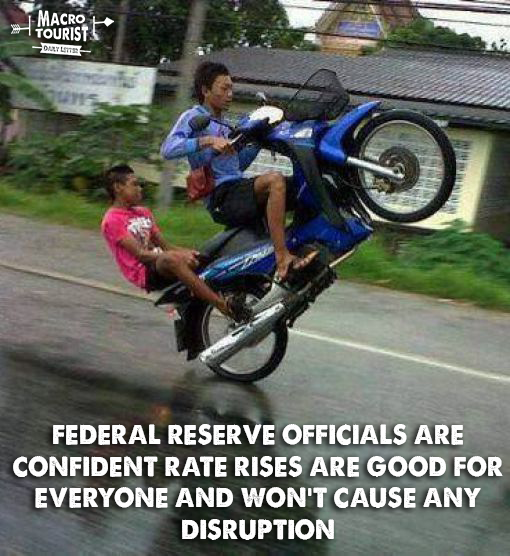 Maybe there is more pain to come before the Fed truly panics. That could be. We will have to watch the Fed carefully for clues. Yet it feels that there is a fair amount of pessimism out there. 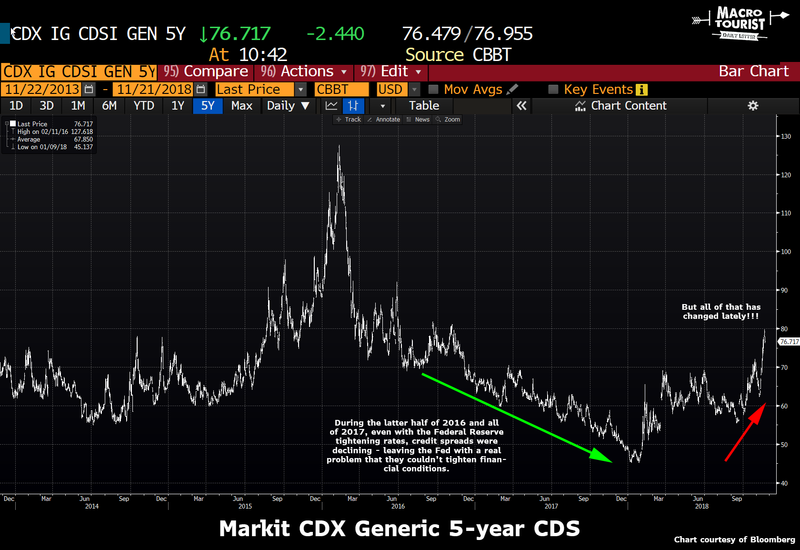 Absolute legends such as Paul Tudor Jones and Scott Minerd are issuing stark scary warnings about credit. These guys are way smarter than me. But if there is one thing I have learned in the post-GFC financial world, it’s that when the hedgies get bearish, it’s time to think about getting out some blue tickets. Just don’t do it in the U.S. markets. The world is dangerously overweight American assets. The cleanest-shirt-in-the-laundry basket has finally begun to smell like the rest of the dirty pile. If you are going to wear something, at least pick something that has been sitting at the bottom.